Beloved and I had dinner at Jin Joo a month ago. This was during our 10th anniversary, and right after we went bowling and had lunch at our beloved Ippudo (linked is the Megamall branch, but we ate at Eastwood). This Korean place was having an ongoing promo where they offered 499 Php unlimited samgyupsal, or grilled pork. Honestly, we weren’t too hungry, but I reckoned that we won’t be going back to Eastwood for a while and the limited offer might no longer be available when we do get back, so we tried it out anyway. 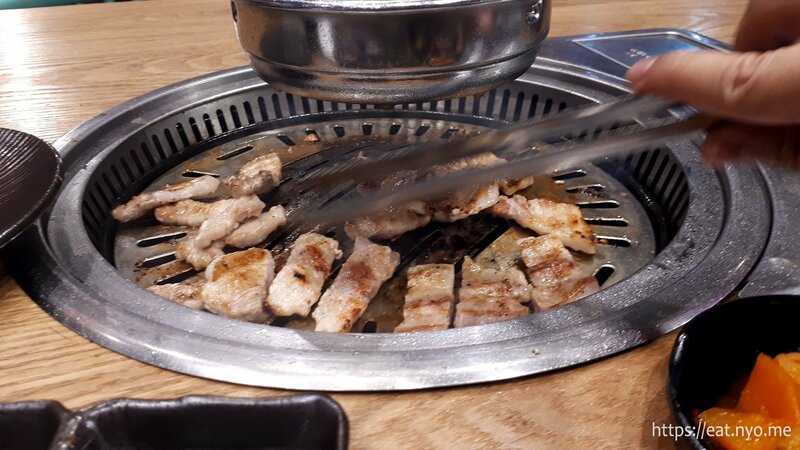 Like most Korean grills, they offer the usual various meats, specifically pork and beef, to be grilled on top of your table. However, they were only offering the 499 Php all-you-can-eat promo for their Samgyupsal. 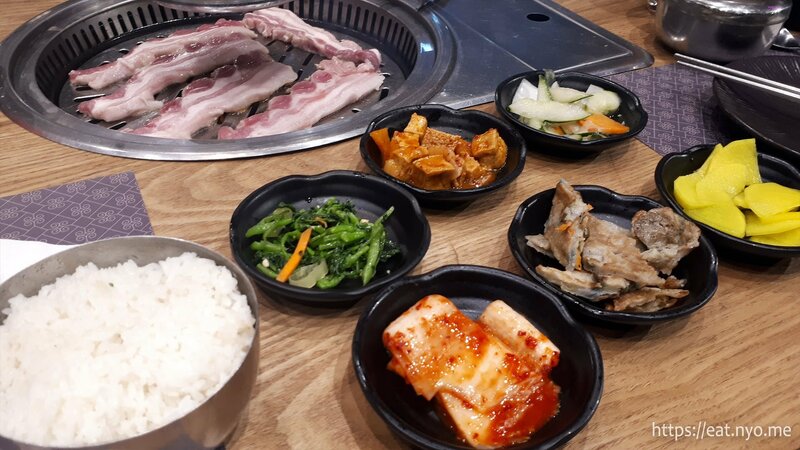 This comes with the usual unlimited banchan or appetizers, again a similar aspect of your usual Korean grill. The first batch of Samgyupsal is already cooked. Actually, you can ask them to cook it for you. 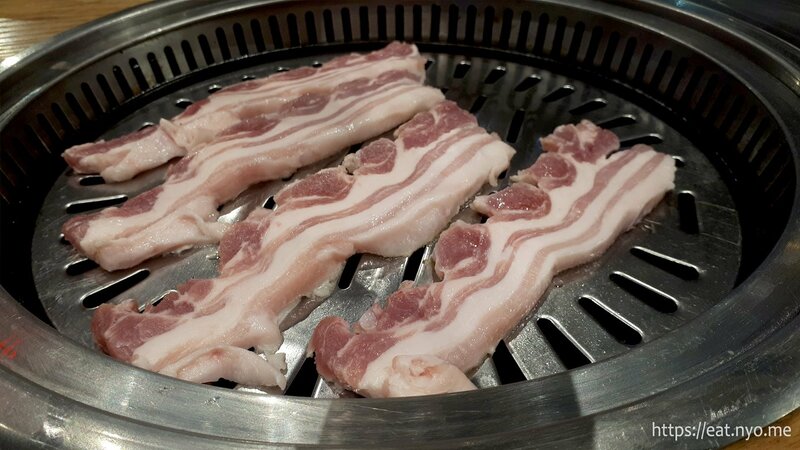 The pork they used was thicker than the unlimited samgyupsal offerings from other places. It was surprisingly cooked well—not overdone and quite delectable. The seared areas gave it a change in texture from tender to a bit of a crisp. Additional raw pork is given to us on a chopping board, ready to be grilled on top of our table. It came on top of a couple of lettuce leaves with more in a separate basket for us to wrap in our ssam-wraps. The banchan that comes with the promo included six variants—kimchi, sesame spinach, picked radish, mapo tofu, pickled vegetables, and Korean pancakes. It also came with a cup of rice. The kimchi was quite spicy, but tolerable and the spinach was my favorite, as usual. 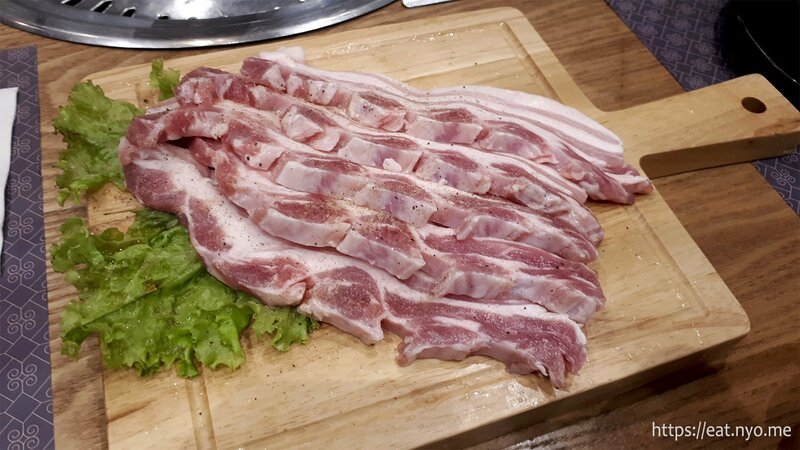 Anyway, part of the fun of samgyupsal is cooking the pork yourself. The tabletop grill is smokeless and has fans at the edge, but it still didn’t keep all of the smoke away. Luckily, the tables also have those exhaust things that you can pull from the top to alleviate the smoke, as shown in the next picture. Since the slices are thicker than we’re used to, it takes a while before you can actually eat. This is the time to enjoy the banchan or make your previous helping go down your stomach for more space. Since it’s quite thick and you get an entire slab of belly, it’s suggested to cut it up into smaller strips. A pair of scissors is given to each table for this exact job. As we already ate earlier, we didn’t get too much refills. We only had two additional helpings of pork, since there’s quite a lot already originally. Also, we only had the spinach and kimchi refilled. Overall, Jin Joo was a decent value. 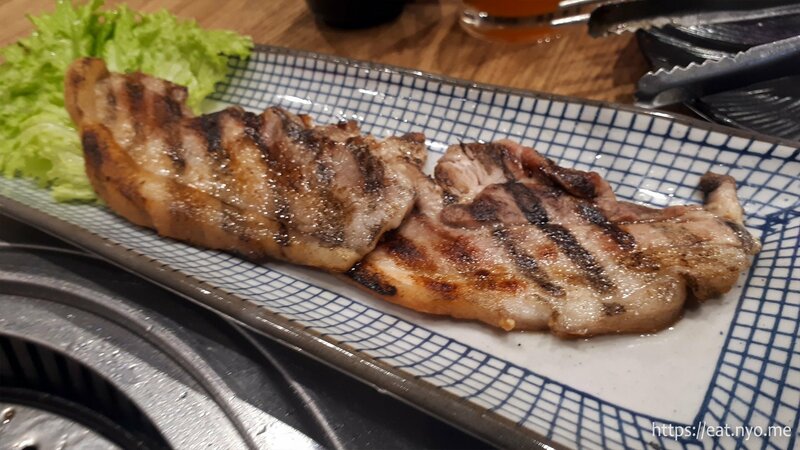 Sure, we know of places that serve the same for less, but those places usually serve much thinner slices of pork and have a less pleasant dining area, usually a bit more oily. Also, that doesn’t really exist near the Eastwood/Libis area, as far as I know. Sadly, since this is a limited promo, I don’t know until when it is available. Their other items are quite pricy. However, the quality of the meat here is definitely better, thicker than the competition. 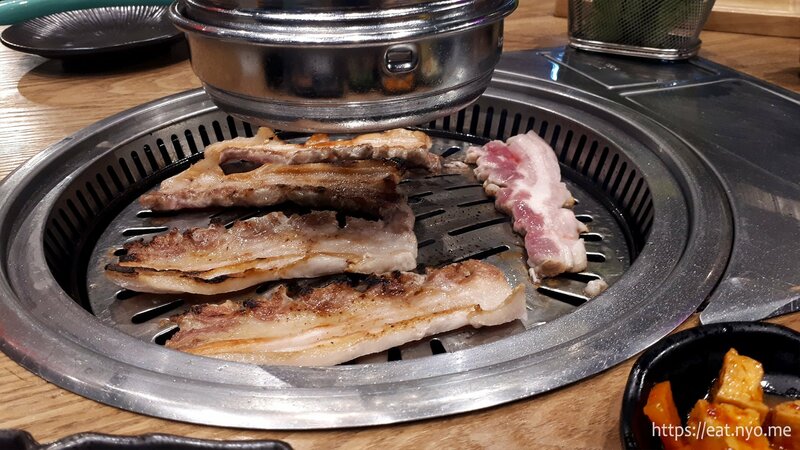 While I cannot vouch for their other offerings, I can definitely recommend Jin Joo’s samgyupsal for a try, especially for pork belly lovers. Recommended for: Banchan, Pork lovers. Not recommended for: Halal folk. Smart nomnomnom tip: Have them cook it for you if you’re feeling lazy—they cook it quite well.